Kim Sater of Mary Kay accepted the brand's awards at innoCos Digital for Best YouTube Channel, Best Facebook and Best Pinterest. Read part one of our innoCos Digital coverage here. Jennifer Stansbury (The Benchmarking Company) discussed the Sephora shopper, building upon insights presented in the two-part Global Cosmetic Industry series, What is the Sephora Shopper Seeking? and What are the Sephora Shopper's Influencers? In particular, she noted, consumers trust Sephora's brands as much as they do those of other beauty brands. Patty Britton of Thin Film Electronics discussed the future of near-field communication for mobile devices, consumers and packaging. She noted that innovations in near-field communication (NFC) technology employing sensors embedded in packaging offer new opportunities for engagement and data collection. Embedded sensors can interact with consumers in-store and post-purchase, providing an ongoing dialogue with consumers that can be customized. ThinFilm's proof of concept, NFC OpenSense, will be incorporated into a five-figure unit order from Diageo for "smart" liquor bottles. 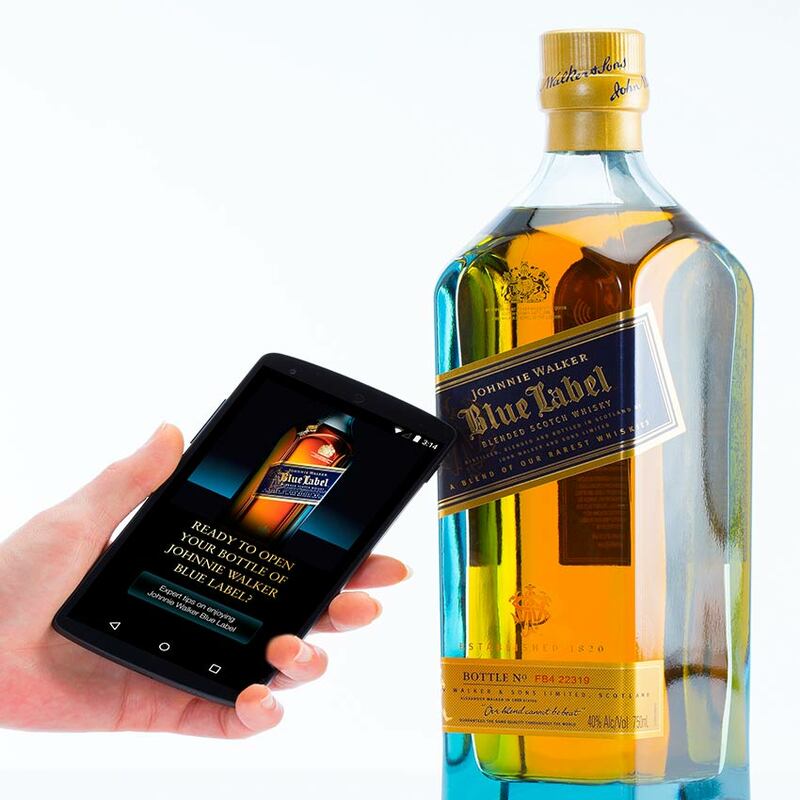 The order is based on a prototype Johnnie Walker Blue smart bottle (below) that was first unveiled at the 2015 Mobile World Congress. The embedded tech will allow Diageo to send personalized marketing messages, promotional offers, cocktail recipes and other exclusive content to consumers who read the tags with their smartphones. The tags work whether or not the seal is broken, allowing Diageo to track the movements of the bottles from manufacturing to retail to consumption and beyond. This can help prevent counterfeiting, unauthorized refilling, diversion, etc. In addition, the tags allow the brand to collect insights into consumer behavior. This so-called "small data," as Britton called it, can be aggregated with other consumer feedback to produce big data for brands to leverage. Tactility matters, said Jessica Richards founder of Shen Beauty, during an innoCos Panel discussion led by Vidur Bhandari (A.T. Kearney). Jennifer Tidy of ModiFace added that retailers could benefit from increased simplicity. Beauty is an emotional category, the panelists agreed. Sourabh Sharma (FIG or out) stressed that while brands can use data to connect with consumers they should not treat customers like date. Richards added that the advent of pop-up shops shows how important hands-on experiences are. They offer an opportunity for brands to test out concepts and build brand awareness while allowing consumers to touch and feel products.